If you read part one of this feature, then you know exactly what this piece is about. For those of you who aren't familiar, I am diving into the strength of the WBS Penguins roster and looking at the key players who will play on a stacked blue line for the Pens. This is undoubtedly a team that is built from the back end-out. For the team to be successful, they will have to blend a talented group of D-men to become a shutdown unit who can also contribute offensively. Part One featured Chad Ruhwedel, Cameron Gaunce, and Stuart Percy. Part Two features mostly returning players and an intriguing, young European. Let's get to it. Lukas Bengtsson signed an entry level deal late last season. 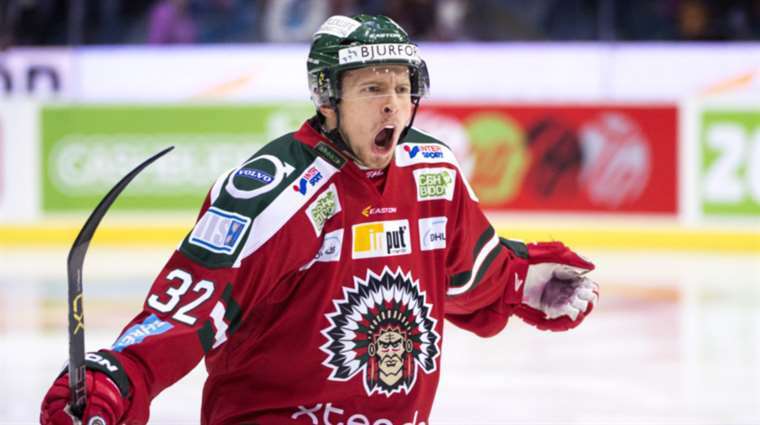 At just 22 years old and only one season in Sweden's top professional league, Bengtsson comes to the Penguins organization with loads of potential. The young defenseman never looked out of place in one of the most competitive leagues in the world, and even excelled. A knee injury cut down on the length of his season as he played in just 30 games, but that was plenty of time for him to make a positive impression and catch the eye of the Penguins front office. He scored seven goals and added seven assists during the 30-game span, and signed a deal with the Penguins late in the NHL season. The young Swede is undersized for a defenseman at 5'9 and 168 lbs, but uses top-tier skating ability and excellent vision to move the puck quickly and avoid situations that could put him in trouble physically. The most impressive aspect of his game is that when you watch him play, his head is up at all times and he has an uncanny ability to navigate traffic with shots from the point. He thrives on the power play and is most comfortable when the puck is on his stick. As good as he is offensively, it is no secret that he needs some work on his defensive play in his own end and down below the goal line. He also must adjust to the North American game. With that said, you can expect Bengtsson to spend most of the season in Wilkes-Barre and be a key component on the AHL blue line. Though he could be a call-up option at some point should injuries arise in Pittsburgh. Much like Dominik Simon used his European Pro experience to excel in the AHL last season, I expect Lukas Bengtsson to make an immediate impact in WBS. 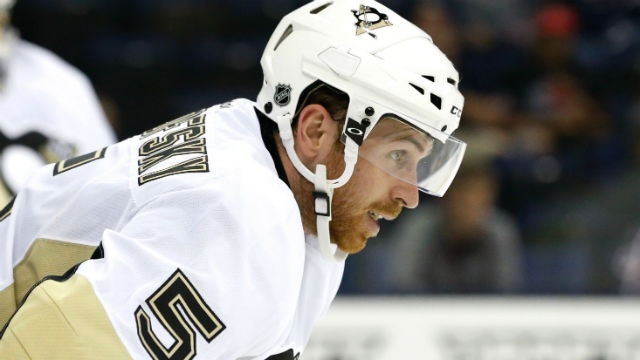 After being claimed on waivers by NJ in Feb., Warsofsky returns to the Pens organization. The veteran AHL defenseman enters his 6th full professional season after playing in a career-high 22 games in the NHL split between the Penguins and Devils (claimed him on trade deadline day). He got off to a bit of a slow start in WBS last season on the stat sheet, but he clearly made an impression on Mike Sullivan who would eventually replace Mike Johnston in Pittsburgh. He had 6 points in 17 games in Wilkes-Barre/Scranton and played well during his call-up to Pittsburgh before suffering a freak injury that sidelined him for nearly a month. He sustained a concussion when he tripped over a linesman while skating backwards, hitting the back of his head squarely on the ice. When the Pens tried to slip him through waivers on trade deadline day to make him eligible for the AHL postseason, the Devils scooped him up and he played the remainder of the season in New Jersey. During his time in WBS, he was a steady presence on the blue line and was playing both on the power play and the penalty kill. Warsofsky has been a very good AHL player throughout his career and his best season came in 2013-14 when he registered 34 points in 56 games. He is a veteran who can play big-time minutes in all situations and will absolutely play a leadership role during any stay in the AHL. He wore an "A" during his time in WBS last season, and played a big role both on and off of the ice. The Penguins very clearly like what Warsofsky brings to the table, and it appears that the defenseman feels the same about the organization after signing a one-year deal to return. Fans of the "Baby Penguins" should be intrigued by the idea of a full AHL season out of him, and that may be the case with the depth within the defensive unit. I expect him to compete for the final one or two roster spots in Pittsburgh. There is no doubt Sullivan is high on him, but at the end of the day, I think Warsofsky returns to northeastern PA. He will be a key piece on a team that looks poised for a great season. Bold Prediction: If Warsofsky spends most of his time in the AHL, he will be an Atlantic Division All-Star. Oleksy is a leader and a shut down D-Man, can play in PIT should injuries arise. Oleksy is a stay-at-home defenseman who is an outstanding penalty killer. 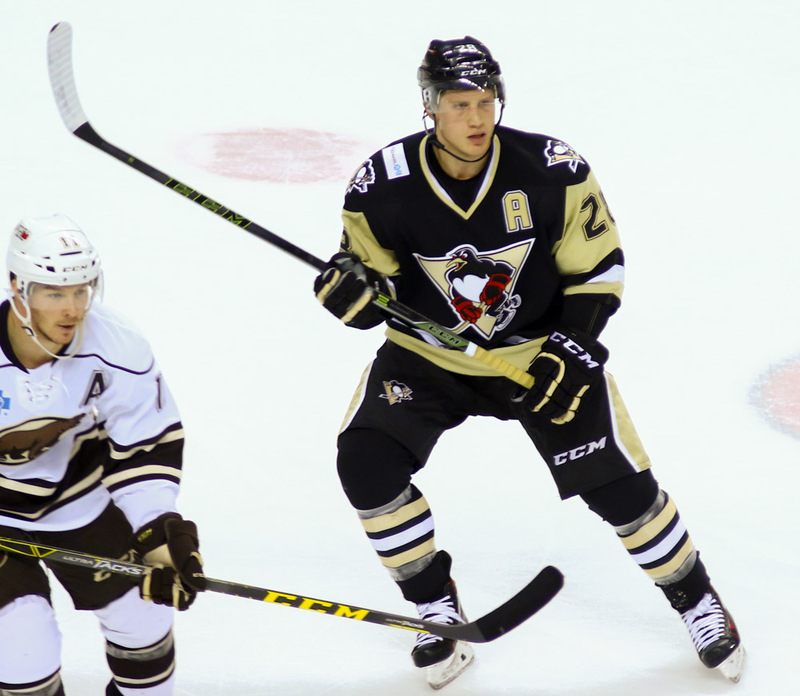 The former Hershey Bears captain came to the Penguins organization last season. He played in 63 games in WBS, while wearing an "A" all season long. He played on the top defensive pairing for the entire campaign and chipped in 2 goals and 17 assists. As good of a player as he is on the ice, perhaps Oleksy is more important as a leader off of it. 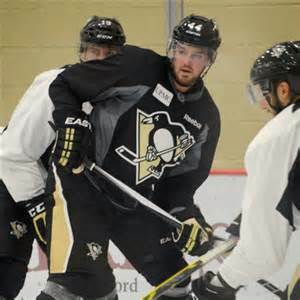 Combined with Captain Tom Kostopolous, it could be argued that the Pens have the best leadership group in the American Hockey League. With plenty of NHL experience (62 games), the veteran D-man is extremely valuable to the organization. That was made evident when he was on the NHL roster as they made their run to the cup this past spring. Oleksy's role within the franchise is unmistakable. He's a reliable call-up option, and sets a prime example of how to be a professional hockey player for the younger prospects in WBS while being a rock on the ice. After becoming a fan favorite in Hershey, he is now on the opposite end of the rivalry and has endeared himself equally to the people of Wilkes-Barre. Never afraid to sacrifice his body or stick up for a teammate, Steve Oleksy is without a doubt one of the most important pieces to the WBS Penguins puzzle. Fans in both Pittsburgh and Wilkes-Barre should be grateful to have Steve-O in black and gold. A Hobey Baker Finalist, Ethan Prow played in 2 playoff games with WBS. Prow enters his first full professional season after a successful college career at St. Cloud State. The Penguins signed the highly-touted undrafted free agent following his senior season, and he comes to them with quite the pedigree. With eight goals and 30 assists in 37 games, the 5'11, 185lb defenseman was a Hobey Baker Award Finalist and the NCHC Player of the Year. He was also All-NCHC First Team and the NCHC Defenseman of the Year. After finishing his NCAA career and signing with Pittsburgh, Prow was assigned to Wilkes-Barre/Scranton and played in five regular season games and two postseason contests. He registered only one assist but did not look out of place, and showed glimpses of the things that made him a superstar in college. An above-average skater who plays with his head up and sees the ice well, Prow is an elite talent on the power play and can rip hard shots with the ability to find shooting lanes through traffic. It will be a challenge for Prow to find a lot of minutes with the talent and depth on defense, but the 23-year-old has the ability and hockey sense to make an impact. He will be given every chance to make the Top 6 in WBS, but should he fail to do that, he will be the first man called upon when the injury bug bites. Tim Erixon struggled at times last season, but has momentum after an excellent postseason. Fans in Wilkes-Barre had high expectations for Tim Erixon coming into last season. On paper, he didn't quite live up to the hype, but he did have his good moments. Most notably his playoff performance, when he registered two goals and four assists in 10 Games, and visibly raised his defensive level of play. He played 65 games during the regular season and had 20 points (3G,17A). Not bad numbers at all for a defenseman, but considering he had 38 points in 40 AHL Games during the 2013-14 season for Springfield, it wasn't the dominant performance the fans and media were expecting. He has an NHL pedigree with 93 Games of experience and there is no doubt the talent and ability are there for Erixon to be a force in the AHL this season. He will be given a long look during camp in Pittsburgh, but I expect him to play big minutes in all situations for WBS. With the momentum of a very good postseason, I think fans in Wilkes-Barre can expect to see the best version of Tim Erixon this coming season. I won't even begin to guess at what the defensive depth chart is going to look like right now, but with camp starting we will surely have a more concrete idea soon. One thing is certain -- the WBS Penguins will have an absolute dynamite defensive unit, loaded with potential NHL Talent. It will be the strength of this squad without a doubt, and that is a big reason for optimism in northeast Pennsylvania! Thanks to all for reading, your time and support are always greatly appreciated! Make sure to follow closely with the season ready to begin. Find me on twitter @jfoo1654 and of course as always on +Pens Initiative. I will have updates from training camp and will be in the press box this season covering the WBS Pens Live.